This edited article about the Winter Olympics first appeared in Look and Learn issue number 548 published on 15 July 1972. Norway, famed for its winter ice and snow-clad slopes, was in trouble. The 1952 winter Olympics were destined for Oslo, the capital. But there had been very little snow, and strong gales were whisking away the flakes that remained. On top of this, the weather forecasts were discouraging. Not even the smallest snowfall was in sight – and the Olympics were less than a week away. One slalom course – a ski-race down course defined by artificial obstacles – was closed. Most of the ski events were to take place at Norefjell, and here three hundred volunteers went to work to restore Norway’s reputation. Soldiers, firemen and civilians joined forces to bring the snow in lorries from hollows where the gale had not whipped it away as on the hills. Firemen showered the slope with water in the hope that this would freeze into a semblance of snow. Unfortunately, the spray from their hoses refused to freeze into sparkling crystals as it descended and became, instead, sheets of ice on the already unstable surface. The volunteers had done their best. But skiers who wanted to train on the slope found themselves slithering and sliding in too much ice or too little snow. 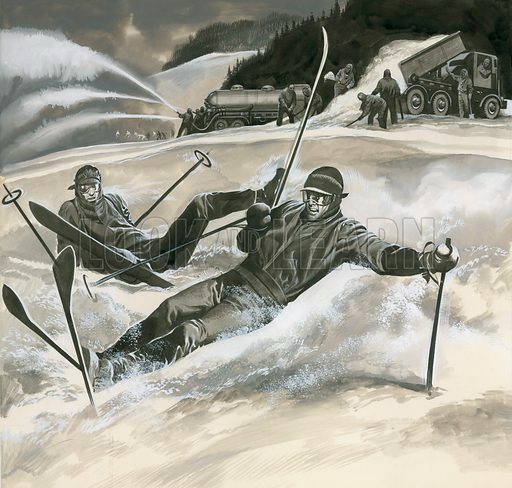 In these unhappy conditions, expert skiers tumbled like novices and people began suggesting that the Games should be switched to Switzerland or the French Alps, where the weather was colder. The Norwegians would have none of this. It was against their national character to allow a little thing like the weather to upset their carefully laid plans. Their reply was to shovel snow even more enthusiastically, and in fact they were still busy heaving snow two days before the Games were due to begin. At last, Norwegian optimism had its reward. The weather man reported that a snow storm was on the way from Iceland. Would it arrive in time to save the Games from becoming a fiasco? Anxious men consulted the weather reports, studied isobars, air pressures and wind flow and kept a close watch on the thermometer. At last the snow arrived, two crisp inches of sparkling crystals . . . and the Games were saved. With its arrival the tumbles on ice changed to artistry on snow when 19-year-old Andrea Mead Lawrence of the U S A shot down the side of the mountain and skimmed around fifty-nine control gates on the slalom course to victory. But this lead was not to last for long Norway soon leapt into the front. Their star was Hjalmar Anderson who won three of the four speed-skating races and gained an Olympic and a world record. The Norwegians excelled, also, in the ski jumping, when King Haakon and the whole royal family saw Arnfinn Bergmann of Norway soar majestically to beat all his competitors, and helped Norway to win its winter Olympic crown.